Break Down Small Debris To Save Space In Your Dumpster. Put Cardboard Or Styrofoam On The Very Bottom Because They Can Smash Down And Free Up More Space! Space is definitely the most precious commodity when it comes to renting a dumpster. You estimate your debris amount prior to renting to make sure you don’t rent a larger container than needed because you don’t want to find yourself in a situation where you end up running out of space or overfilling your dumpster. This could mean extra fees and more headaches. Since you are counting on this space for your debris, make sure you pack the dumpster efficiently to free up as much space as possible. Put softer materials such as styrofoam and cardboard on the bottom because these items will compress under the weight of heavier debris and free up space. Line the walls of your dumpster with flat items, such as doors, and break down any smaller debris to fill in the gaps left in between large, bulky debris. Taking the time to think strategically and maximize your space will not only save you money but could free up enough space for you to get rid of even more debris. Find Out What Fees You Could Be Charged For Breaking Weight Or Overfill Limits! Everyone here at Same Day Dumpsters wishes you a prosperous 2019 full of happiness, hope, good health, good tidings and many opportunities! 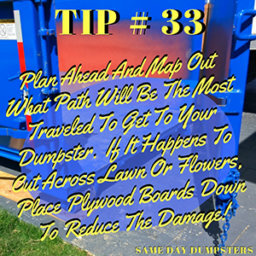 Scouting out the path debris will travel to your dumpster can save you from creating additional work for yourself by preventing needless damage from occurring. Not every dumpster rental service is created equal. While they may have the same type of materials, there are quite a few factors to consider when choosing the right company to help you complete your project.